Mickey teammates pictured at the awards presentation (from left): Margie Richardson, Carl Mickey, Joe Barnes (United Way), Gail Wells, Dean and Matt Sink. 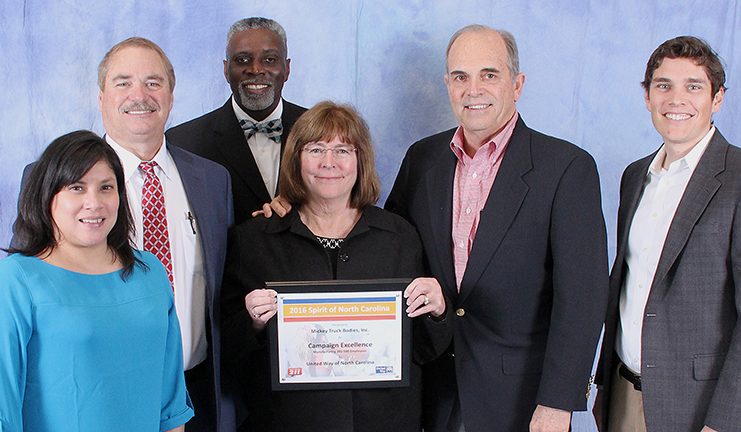 Mickey Truck Bodies has received The Spirit of North Carolina Award for Campaign Excellence from the United Way of North Carolina. The prestigious award recognizes outstanding companies and their employees that “demonstrate campaign excellence and community commitment through local United Way involvement.” Only 33 companies across North Carolina received this award based on volunteerism, employee participation and giving levels, year-round education, corporate support, incentive programs and campaign rallies, among other criteria. Mickey employees have participated 100% in each of the annual United Way campaigns for the past several years.